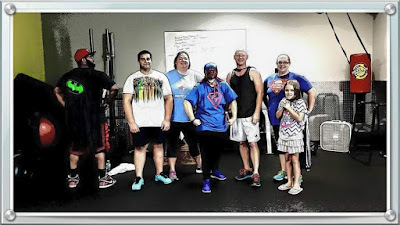 Today was Superhero Saturday at FT and these are all the superheroes that showed up this morning and conquered the workout! And let me tell you, you had to be a superhero to survive the suicide burpees we had to do. That would be me in the middle with the mask. I wanted to be a mysterious superhero. Actually, I was trying to hide the tears I had shed during the workout...lol. The dude on the far left standing backwards was our trainer today and that's Juan. See, working out doesn't have to be boring, and even when it's hard, it can be fun. I wouldn't want to start my Saturdays any other way.